When John Long first moved to The Villages from Virginia in 2013, he noticed golf carts zooming past him left and right on the roads. One, after the other, after the other. The carts are hard to miss. 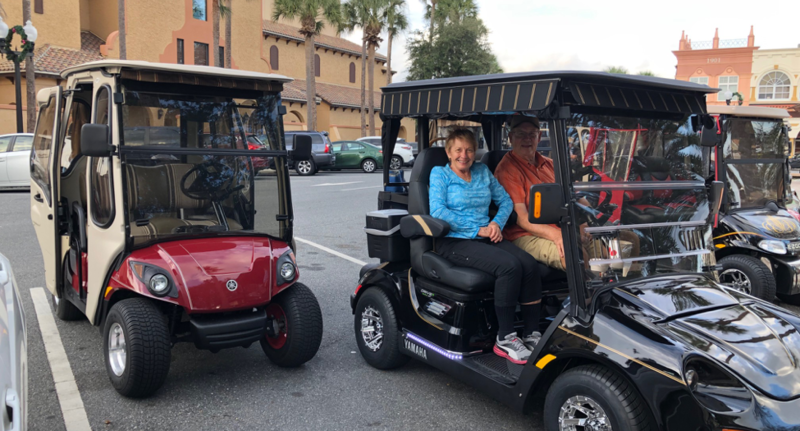 The Villages, a retirement community where most of the inhabitants are over the age of 60, is home to approximately 125,000 people and more than 50,000 golf carts, according to Babiarz Law Firm of The Villages. Like many around him, Long owns a golf cart which he uses to get from place to place. However, his cart has a seatbelt. WUFT News visited a popular shopping center where the parking lot had a designated golf cart parking area. Of the 16 carts there, three in four of them did not have seatbelts installed. For 35 years, he worked as a body man in Virginia Beach, Va. before retiring to The Villages. Once in Sumter County, he noticed a lack of seatbelts in the popular mode of transportation and decided to take out his tools once again. Long put out an ad in the newspaper for an installation service and began receiving calls within the week. On average, he installs 20 seatbelts each week. With thousands of installations under his belt, Long frequently runs into past customers who thank him for helping to keep them safe. 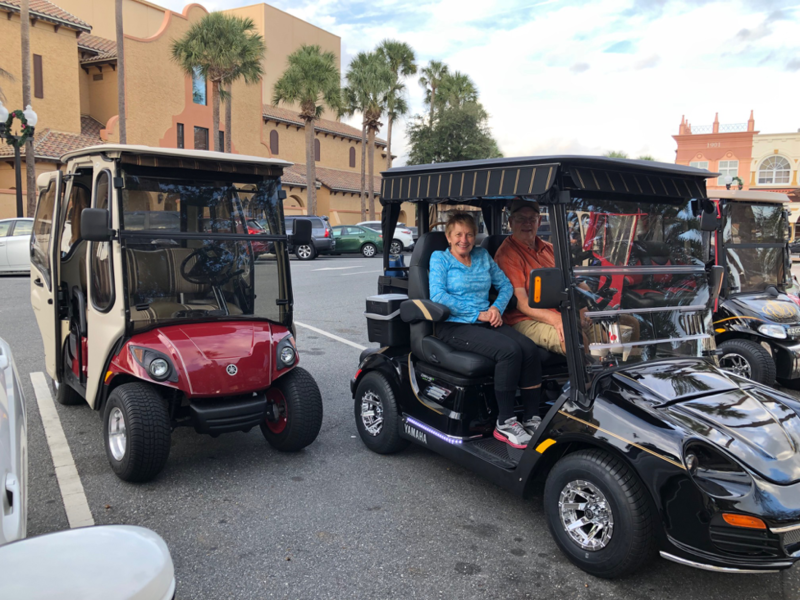 Approximately 17,000 golf cart crashes and accidents requiring a hospital visit occur annually nationwide, according to the United States Consumer Product Safety Commission. 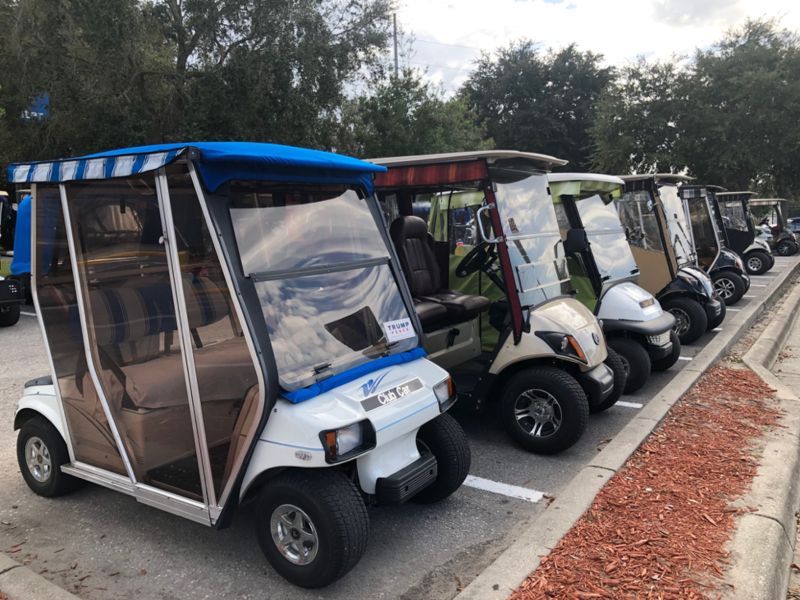 The Villages Department of Safety reported responding to at least 86 accidents involving golf carts in 2018. Sixty-three of these involved injuries. The department did not provide how many of these involved fatalities. However, a crash between a golf cart and pickup truck on Nov. 26 resulted in the death of 88-year-old Frederick Kaiser, according to a Florida Highway Patrol incident report. Kaiser hit his head on the pavement after the collision threw him from his seat. He was taken to Ocala Regional Hospital where he died a few days later. “The wrong place at the wrong time. That’s all it takes,” Long said, recalling his own close call a few months back where a driver nearly ran into him after missing a turn. 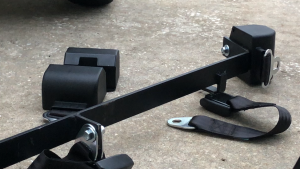 Long’s seat belt installation involves five pieces, which take 20 minutes to secure on the cart. “There’s very few carts I haven’t been able to install seatbelts on,” he said. The average cost of installation ranges from $90 to $160. While installations get pricier if there’s a custom fit involved, Long feels it’s worth every penny. Babiarz Law Firm takes on personal injury cases within The Villages area. Some of their most common calls are regarding clients recently involved in golf cart accidents. Golf cart accidents weren’t exactly what Tim Babiarz had in mind at first. “Over time it evolved into part of my practice,” said Tim Babiarz, who has practiced law for nearly 25 years. In addition to court duties, Babiarz leads a community golf cart safety seminar. He’s gotten into the habit of asking participants how many have seatbelts in their carts. In 2010, 15-percent admitted to having the accessory in their vehicles. 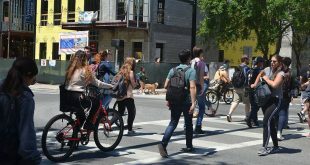 The number has dramatically increased in the last decade, according to Babiarz. 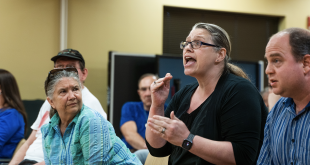 In September, 80-percent raised their hand for the same question. “The word is getting out. They can make or break your surviving a crash or surviving it in good shape,” Babiarz said. There are no existing Florida laws demanding the use of seatbelts in golf carts. Traditionally, golf carts aren’t meant to travel faster than 20 miles per hour. If the cart goes faster than this, it is considered a low speed vehicle and its users would effectively need to wear a seatbelt according to Florida law. 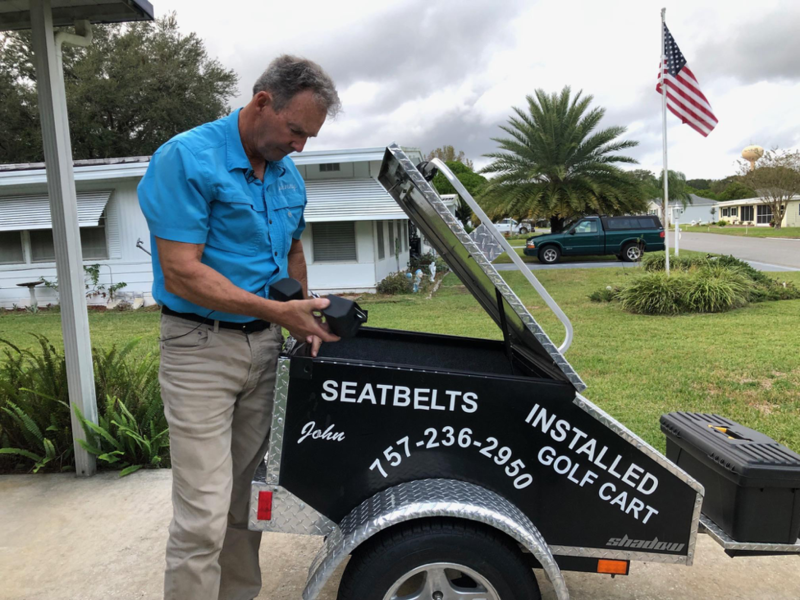 But seatbelt or not, the frequent use and popularity of golf carts on The Villages roads stack the chances of getting into an accident against drivers. There are various reasons people use to justify not installing a seatbelt. One of Long’s customers confessed he believed his reflexes would save him by allowing him to jump out of the cart before it crashed. “I’m thinking, who does this guy think he is? Spiderman?” Long said. Others have gotten creative with their homemade seatbelts. 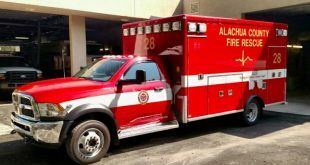 From The Villages the nearest trauma centers are in Ocala and Orlando. When residents get into accidents, they have to travel approximately an hour for appropriate medical help. For serious injuries, a medical airlift can cost on average between $12,000 and $25,000. 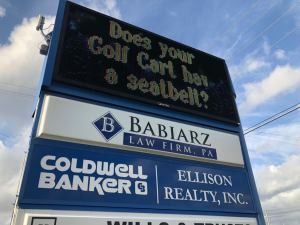 While there are currently no proposed laws to add seatbelts to golf carts in the state, Babiarz believes it’s only a matter of time before this changes. “I think a logical evolution is to put seatbelts in golf carts,” he said. Long knows trying to encourage the purchase of seatbelts is tough as long as it’s a driver’s personal choice. Correction appended: A previous version of this story contained the 2010 estimate of The Villages’ population at 50,000. It is today closer to 125,000. Sofia is a reporter for WUFT News who can be reached by calling 352-392-6397 or emailing news@wuft.org. If seatbelts were safe for golf cars they would be installed at the factory. There is no crash protection in a golf car so it is far safer to be thrown out of it rather than being tied to it in case of a collision with a motor vehicle. While it may keep someone from falling out going around a corner it is not safer by any means.